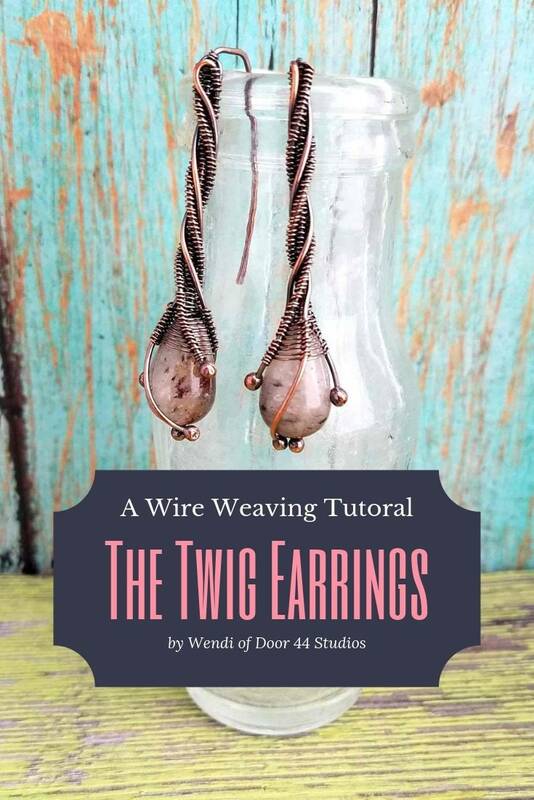 My Twig Earrings are far and away my most popular design, and now you can make them yourself! This 13-page tutorial contains more than 20 images and all the information you’ll need to make these pretty threader earrings. 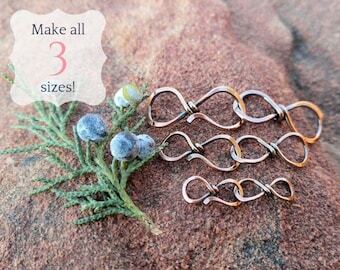 I've even included detailed instructions for resizing, so you can make these earrings to suit you perfectly. FINISHED DIMENSIONS: About 3/8-inch wide x 2-inches long. You can customize the length by simply modifying the length of the core wires. The overall width of the earrings depends on the beads that you choose. This tutorial assumes you're familiar with the basic Figure 8 Weave and that you know how to ball wire ends with a micro torch. I don't discuss these techniques in detail in this tutorial. However, I will be posting regular articles on technique on my blog (door44studios.com). So, be sure to sign up for my newsletter, if you haven't already done so. You can preview this tutorial on my blog for free! This downloadable PDF version contains a lot of extra tips and tricks that aren't included in the free version along with a detailed discussion about resizing the earrings. You'll also find a complete list of resources for the supplies I used to write this tutorial. You may sell items you make from this tutorial. If you do so, credit Wendi Reamy of Door 44 Studios for the design. I reserve the rights to all images and instructional content within this product listing and the downloadable PDF tutorial. The tutorial and design, including all images, are subject to copyright and are the sole property of Door 44 Studios. You may not copy, sell, or distribute this pattern under any circumstances. You may not teach the design(s) in this tutorial without my written permission. I haven't created a pair of earrings in a long time. Your tutorial has inspired me to make a few pairs for myself. The tutorial is well written and I appreciate all the time and effort that has gone into it. I have quite a few round beads that I hope I will be able to adapt to this tutorial. After reading it I am sure I will be able to create many new designs. Thank you for the beautiful tutorial and your wonderful attention to detail. Can't wait to try my hand at this tutorial. Everything about this jewelry set is wonderful! The wire work is amazing! I enjoy working with customers to create something uniquely personal, and I welcome custom and personalized order inquiries. Please understand, though, that these orders take up a considerable amount of my time and energy to produce. For that reason, custom and personalized items are not eligible for sales or promotional discounts. As custom orders tend to vary quite a bit in complexity and price, I will set all other transaction terms (such as a security deposit or guaranteed ship date) on an individual basis. Convo me with as much detail as you can provide about the piece you'd like me to create, and we'll work out the final transaction terms together. 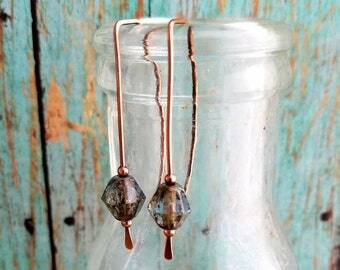 Earrings: I use 20 gauge wire for all pierced ear wires and posts, unless otherwise stated in the product description. You'll also find the general length and width listed in the product description. When in doubt, convo me for clarification. 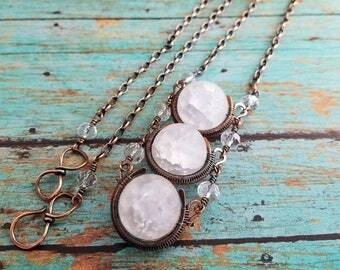 Necklaces: I specify both the chain length and the pendant drop in the product description. The chain length is measured from end to end. The pendant drop is measured from the bail (the point where the pendant attaches to the chain) to the bottom of the pendant. Bracelets: The sizes stated in the product descriptions for bracelets indicate the inner circumference of the band. I can generally make any bracelet to a custom size. Convo me for more info on custom bracelet sizes. I use raw, uncoated copper and silver wire, which is treated to achieve an aged patina unless a customer specifically requests a bright metal finish. To maintain the original finish, store your jewelry in an airtight container, such as a Ziploc bag, when not in use. Keep all jewelry away from harsh chemicals, such as perfumes or cleansers, and keep it dry. You can clean your jewelry in a solution of warm water and mild dish soap. You can also restore shine with a jewelry polishing cloth. 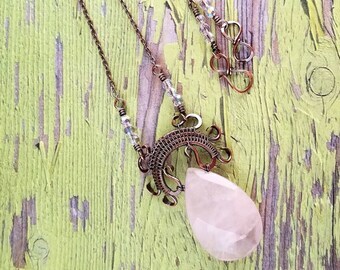 One of the things I love most about raw metals is that they take on a warm, natural patina with regular wear. 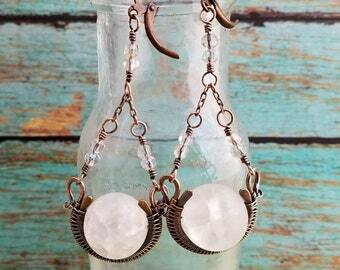 Embrace the natural beauty of your Door 44 Jewelry. Wear it often, and it will reward you with a beautiful glow that is uniquely yours! All Door 44 Jewelry is shipped gift ready in a brown paper pillow box tied with a black grosgrain ribbon. I may add seasonal adornments to my packages or change the color of the ribbon for various holidays. However, the brown paper pillow boxes are standard. You'll find pictures of both my standard packaging and my holiday packaging in my shop updates. Please specify in the order comments if you'd like a package to be shipped directly to a gift recipient without a purchase receipt. If you'd like a handwritten note to be sent with a gift, include that message in the order comments as well. I am not actively seeking wholesale customers at this time. I fully guarantee my craftsmanship for five years from the date of purchase. If your jewelry needs to be repaired, resized, or even just cleaned and refreshed, convo me so we can work out the specifics of your request. All shipping costs and insurance, if desired, are the responsibility of the buyer.